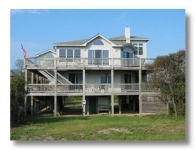 Heavenly Semi-Oceanfront Outer Banks vacation home in located in Sanderling affords easy beach access and the conveniences of shopping in nearby Duck. Level 1: Covered entry; outside toilet & shower; two storage areas. Level 2: Master Bedroom (King) Oceanside with television, deck access and whirlpool tub; Master Bedroom (Queen) oceanside with television & deck access; Bedroom (two Bunks); Bedroom (two Twins) with television; full hall bath; laundry; deck with hot tub. 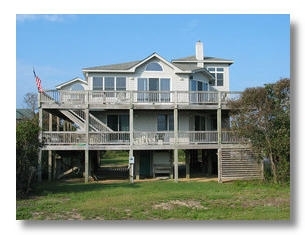 Level 3: Master Bedroom (King) Oceanside with television, whirlpool tub and deck access; Great Room with deck access and ocean views; dining room with seating for ten; screened porch on the westside of the home; full kitchen.